Whether it's corner-carving performance or straight-line acceleration you crave, you'll find a performance package that's exactly right for your Mustang with one of Ford Racing's Performance air filter and calibration kits. 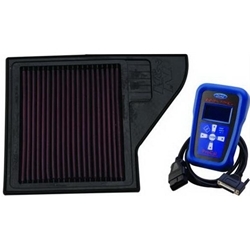 Each of the Ford Mustang kits packs include a K&N filter and ProCal tool with the performance calibration to help unlock your pony car's true potential, generating optimal horsepower and torque, while delivering engine durability and drivability. Plus, these upgrade kits are 50-state emissions legal! Notes: Kit includes ProCal tool with performance calibration. This kit does not include a programmer with the initial shipment, only a voucher. Once the product is registered with Ford Motorsports, a custom programmer is sent and the kit can no longer be returned.